Iterative deepening (ID) has been adopted as the basic time management strategy in depth-first searches, but has proved surprisingly beneficial as far as move ordering is concerned in alpha-beta and its enhancements. 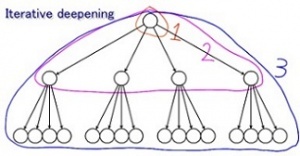 It has been noticed, that even if one is about to search to a given depth, that iterative deepening is faster than searching for the given depth immediately. This is due to dynamic move ordering techniques such as; PV-, hash- and refutation moves determined in previous iteration(s), as well the history heuristic. It works as follows: the program starts with a one ply search, then increments the search depth and does another search. This process is repeated until the time allocated for the search is exhausted. In case of an unfinished search, the program always has the option to fall back to the move selected in the last iteration of the search. Yet if we make sure that this move is searched first in the next iteration, then overwriting the new move with the old one becomes unnecessary. This way, also the results from the partial search can be accepted - though in case of a severe drop of the score it is wise to allocate some more time, as the first alternative is often a bad capture, delaying the loss instead of preventing it. Iterative deepening, using a transposition table, embed the depth-first algorithms like alpha-beta into a framework with best-first characteristics. Depth-first iterative-deepening has no doubt been rediscovered many times independently. The first use of the algorithm that is documented in the literature is in Slate and Atkin's Chess 4.5 program . Berliner  has observed that breadth-first search is inferior to the iterative-deepening algorithm. Winston  shows that for two-person game searches where only terminal-node static evaluations are counted in the cost, the extra computation required by iterative-deepening is insignificant. Pearl initially suggested the iterative-deepening extension of A*, and Berliner and Goetsch  have implemented such an algorithm concurrently with this work. ↑ Hans Berliner, Gordon Goetsch (1984). A quantitative study of search methods and the effect of constraint satisfaction. Tech. Report CMU-CS-84-147, Department of Computer Science, Carnegie Mellon University, Pittsburgh, PA. This page was last edited on 24 November 2018, at 12:14.